In the early years of Sultan Muhammad Shah's reign, in 1362 AD, Kanya Nayak of Tilangana joined forces with Bukka of Vijaynagar to wrest territories adjacent to Raichur and Mudgal as far as river Krishna from Bahmani sultanate. The Raye of Tilangana sent his son , Vinayek Dev, from Warangal with a large army consisting of infantry as well as cavalry, towards the fortress of Kaulas, while Vijaynagar sent twenty thousand troops to Kanya's help. Against these the Sultan sent Amir-ul-Umara Bahadur Khan, son of Ismail Mukh Afghan, Azam Humayun and Safdar Khan Sistani along with the army of Berar and Bidar. The main Royal force met the allied Tilangana-Vijaynagar near Kaulas, defeated it and pursued it as far as the gates of Warangal. Kanya Nayak was forced to pay one lac of hons as tribute and had over twenty-five elephants as indemnity of war. Next year Raye of Tilangana approached Firuz Shah Tughlaq, requesting him to ask those in Gujarat and Malwa to attack the Deccan and promising aid to the invaders by his own armies as well as by those of Vijaynagar. The Sultan now lost no time in invading Tilangana in full force. He ordered Safdar Khan Sistani to go to Warangal , capital of Tilangana, with the army of Berar and marched right up to the place himself. Not expecting help from Raye of Vijaynagar or any other quarter, Kanya Nayak begged Bahadur Khan Afghan to solicit the King saying that what he had done in the past against the Sultan was owing to pressure on the part of Raye of Vijaynagar to take his side, and now he fell on the mercy of Sultan Muhammad Shah. He accepted all the conditions imposed on him and had to give to Sultan 13 crores of hons, three hundred elephants, two hundred horses as well as town of Golconda and its dependencies. Bahmani Sultan also gained possession of Turquoise throne from Warangal. Soon after, Bukka, the Raye of Vijaynagar, started invasion of Bahmani sultanate with eight thousand cavalry , nine lacs (Nine hundred thousands) of infantry and three thousand of Elephants, making Adoni his headquarters. The Bahmani armies of Berar and Bidar had gone through an arduous campaign in Tilangana recently, so the Sultan allowed some respite and ordered Khan Muhammad to go to south with army of Daulatabad. In the meantime Raya had crossed Tungabahadra, captured Mudgal, which had been garrisoned by barely 8000 soldiers, putting to the sword men, women and children who came in his way. On hearing this, Sultan crossed the Krishna. The very appearance of Sultan at Mudgal was enough to put the Vijayanagar army to flight and the Sultan entered it triumphantly. He killed seventy thousands of the enemy and captured two thousands elephants, three hundred gun carriages, seven hundred Arab steeds and one bejeweled throne - all this beside the booty which fell to the nobles. After passing of rainy season, Sultan moved southwards with a large army and , and crossing the Tangabhadra, entered the territory of Vijaynagar. Bukka hearing of this movement , gathered togather practically all the fighting forces of his empire and came out himself to give battle to the Bahmani army. He appointed Bhojmal Rai commander in chief of his forces which amounted to forty thousand cavalry and five lacs (500,000) of infantry. Sultan Muhammad on his part crossed the Tungbhadra near the present town of Siruguppa with fifteen thousand cavalry and fifty thousand infantry, out of which he ordered Khan Muhammad to advance with forward with ten thousand cavalry, thirty thousand infantry and the whole of the artillery when the opposing forces were barely 12 kroh from one another. The battle was joined some where near the village of Kautalam. The center of the Bahmani army was led by Khan Muhammad, right flank by Musa Khan Afghan and the left flank by Isa Khan Afghan. The two flanks were in great danger when both the commanders were killed by musket balls and it seemed that Bahmani army would soon be routed. Sultan Muhammad Shah, however, appeared with three thousand cavalry at the nick of time. Terrible hand-to-hand fight ensued, Khan Muhammad's elephant, sher-i-shikar, advanced into the enemy lines, killing the commander-in-chief , Bhojmal Rai outright. The battle ended in defeat of Vijayanagaris. After spending a week at Adoni mopping up the remnant of Vijaynagaris, the Sultan marched to the city of Vijaynagar itself. The Rai had to recourse to Guerrilla warfare. Due to which, the Sultan preferred to retreat than to follow up a campaign which might end disastrously. On the way back, Rai's Guerrilla forces kept on harassing Sultan's forces. But when the Sultan was in his own lands after crossing the Tangabhadra, he ordered the army to stop and attack the Rai's camp in full force where he was engaged in music , dancing and drinking. Raya had to retreat , not stopping till his capital was reached. Bukka now called together the chiefs of his kingdom and took counsel from them. 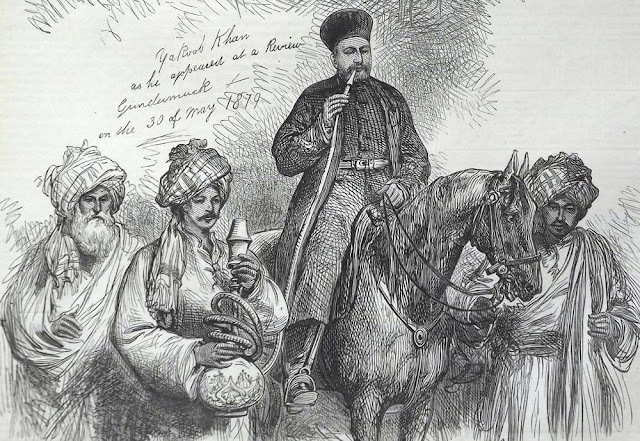 They were unanimous that just as his predecessor was on friendly terms with Bahman Shah so it would be far better if he were to have friendly relations with present Sultan. Envoys were therefore sent to Sultan's camp requesting peace and appealing for brotherly relations between the two neighboring states. Bukka and Kanya continued to pay tribute during the rest of Sultan's life.